Liverpool travel to St Mary’s Stadium on Friday night knowing, if results go their way, they could finish the week five points clear at the top of the table. Jurgen Klopp’s charges have won four of their last five Premier League matches and are 13-games unbeaten following their loss to Wolves during the first week of January. Into the home stretch of the season, Liverpool can’t afford any slip-ups if they’re to win their first ever Premier League title. On paper, a trip to the South Coast isn’t the trickiest for the Reds. Southampton are 16th in the table and have just eight wins to their name this term. However, they have won three of the last four, including a 2-1 win over Spurs recently, and look transformed under Ralph Hasenhuttl. The Austrian was appointed in early December, replacing Mark Hughes, and quickly went about shaping the squad. He sent former Manchester United transfer target Cedric out on loan to Inter while Wesley Hoedt joined Celta Vigo. It was brave on the former RB Leipzig manager’s part but his decisions have been justified. Yan Valery has been one of the standout performers at right-back for the Saints over recent weeks, even chipping in with key goals, while Jan Bednarek has looked solid in the heart of the defence. Under Hasenhuttl, Southampton have beaten Arsenal and Spurs, taken a point off of Chelsea and pushed Manchester United all of the way during a 3-2 defeat. 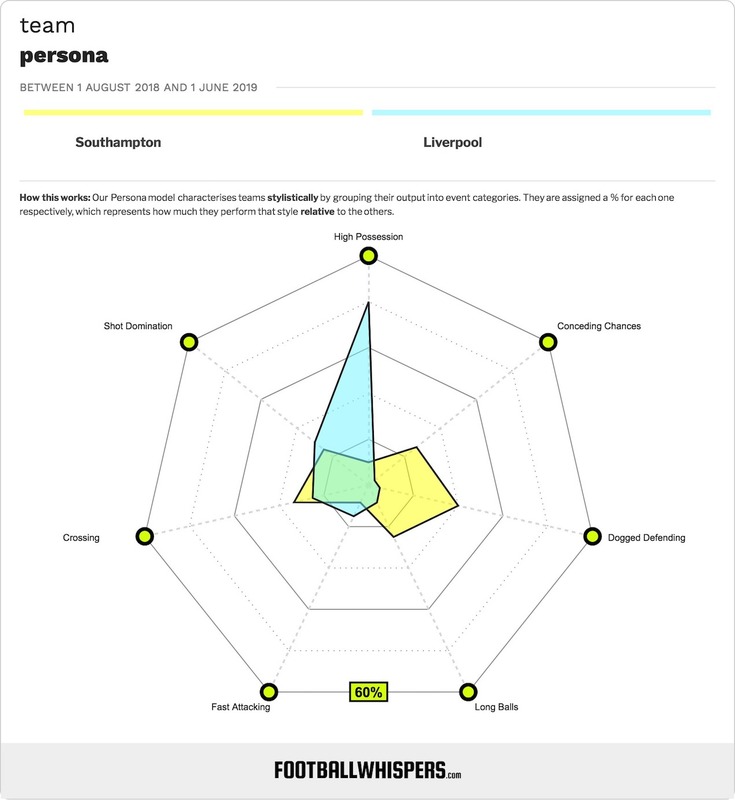 As many had expected, Hasenhuttl’s Southampton share similarities with Hasenhuttl’s RB Leipzig. The German outfit stunned the Bundesliga during the 2016/17 season with their mid-press blitz approach, and the Saints have adopted a similar approach. 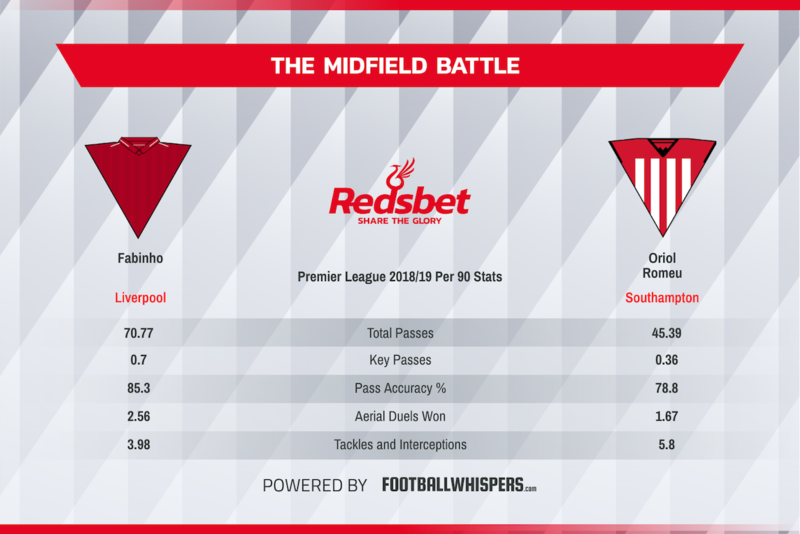 Since Hasenhuttl’s appointment, only three teams win the ball more in the attacking third than Southampton average (4.58), while only one team can surpass their 27.76 possession regains in the middle third. The Austrian tactician has looked to spread the goals throughout his side and now the midfielders are averaging 0.56 goals on a per 90 minute basis, the seventh highest average in the top flight since December. They’ve also introduced an unpredictability to their style by taking more shots from distance. In fact, only one team has scored more goals from outside the box on a per 90 basis since Hasenhuttl took over. A lot of the play comes through Oriol Romeu but Nathan Redmond is the danger man. The one-time Birmingham City man has the highest xG90 average for the Saints as well as the highest xA90. If Southampton are going to cause problems for the Reds then you can guarantee Redmond will be at the heart of it. While the Saints might be much better going forward under Hasenhuttl, they are still struggling defensively. The average of 14.5 shots conceded per 90 is the fifth worst in the top flight this term. Furthermore, Southampton have kept just three clean sheets in 18 matches. They’re allowing shots and they’re conceding goals. Liverpool will be confident about finding the back of the net on Friday evening. Liverpool will want to control the middle third against Southampton and that is why Fabinho should be recalled to the starting XI after having to make do with a place on the bench on Sunday. The game against Spurs was chaotic and Klopp selected a midfield suited to that style. This time around, it’ll be more of what Liverpool are used to with a team sitting deeper, as evidenced by the mid-press used by the Saints. Fabinho’s use of the ball will be key for the Reds and his 0.7 key passes on a per 90 basis will be a welcomed addition to the middle third. Romeu will be busy in midfield and his average of 5.8 tackles and Interceptions could well spike with him looking to keep tabs on a fluid Liverpool forward line. While it won’t be as easy as some might think, Liverpool should have more than enough to pick up all three points. Klopp’s side have six cup finals left to play and the German needs to make sure his players know what is at stake.